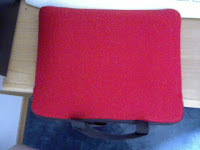 I received the ThermaPod in red. A quick and easy lunch system that will brighten your day! The therma pod Carry case is soft to the touch and is made from a super soft foam for those oopsie I dropped it accidents that are and will occur on a daily, weekly, monthly, yearly basis when it comes to kids or like me..clumsy grown-ups. the Carry handles comes in a jet black and is made from thick nylon material. The foam jacket half zips for no spill moments. made from 100% polyethylene and vinyl acetate. The ThermaPod is the perfect size for children to take to school for lunches, to class trips, or even for long road trips the grandparents house, or grownups that portion meals for their diets The ThermaPod is all made from hard plastic so there will be no wear and tear or no metal cutting fingers or any fabrics. ThermaPod has 2 sides, left side is for sandwiches, meat loafs or other larger portioned meals, and the right side is for fruits, veggies, chips or other side dishes. 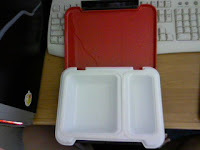 below the side dish portion has a flip down lid where you can store your spoons, forks, knifes, and napkins, ThermaPod comes with great made plastic eating wear such as a plastic fork, spoon, knife and plastic chop sticks..How cool is that. You can remove the tray to hand wash or it's even dishwasher safe! I love my ThermaPod I wish I had discovered this along time ago. And so will you! ♥ I receive no monetary compensation for this review. I was provided a ThermaPod to try and give my honest opinion.